The premise: In the skies, war wages between an evil, post-Empire upstart known as the First Order and a Rebel Alliance-esque band of heroes called the Resistance. On the remote desert planet of Jakku, a young scrap-metal trader named Rey bumps into a lost droid bearing a message that could tip the conflict in anyone’s favor. And in the back row of a Stormtrooper battalion, a defiant soldier decides he’s done with the whole "killing nice people" thing. Worlds collide and blasters start blasting. The cast: Newcomer Daisy Ridley, the spliced clone of Natalie Portman and Keira Knightley, stars as Rey, an ace pilot, bone-breaking fighter, and total loner who bides her time sifting through fallen Star Destroyers. Attack the Block’s John Boyega plays Finn, the aforementioned runaway Stormtrooper who’d be a great swashbuckler if he wasn’t as terrified as C-3PO. Oscar Isaac (Inside Llewyn Davis) co-stars as the Resistance’s top operative, while Girls’ Adam Driver creeps around as the villainous Kylo Ren, who seriously hated working part time at Hot Topic during his MFA program because, hoo boy, he's a vicious, emo Vader. Harrison Ford, Carrie Fisher, and Peter Mayhew return as Han Solo, Leia Organa, and Chewbacca, respectively; 32 years down the line from Return of the Jedi and they don’t miss a beat. The director: J.J. Abrams, the man behind Lost as well as the current Star Trek reboot movie franchise, grabs the baton from George Lucas. With significantly less lens flare, but all the momentum and mystery of his past, Abrams sprints Star Wars into the modern age. In Lucas’ day, the Millennium Falcon was lucky to turn 180 degrees and spin through a Death Star interior. Now it swoops, barrel rolls, and becomes the leading lady it was built to be. What works: Star Wars '77 took its time. Even with the ultimate war between good and evil erupting in the background, Lucas prioritized looking around the room at all the otherworldly stuff, and letting us sit and listen to Luke, Obi-Wan, and Han talk Jedi mumbo-jumbo. We knew these guys when the Death Star finally went kablooie. The first half of The Force Awakens applies this lesson to powerful effect. Glimpses of the First Order in action, as they execute attacks and fly banners, prep us to accept that they out-Nazi the Empire. The introduction of Rey -- a determined gearhead caught in a whimsical, sun-baked malaise -- offers a bright alternative. And when she bumps into Finn, it’s an explosion of chemistry. All the slapstick Lucas tried and failed to work into his bustling entries comes to life here, thanks to the magnetic performances of Ridley and Boyega. Endearingly, they essentially comprise the two sides of Lucas' beloved Indiana Jones: one's punchy and the other keeps falling over. Speaking of Professor Jones, after not quite hitting the mark in Kingdom of the Crystal Skull, Ford revives Han Solo as the kooky uncle Rey and Finn never had. He’s the emotional center of the movie, both friend and mentor to the pair, capable of dishing wry advice while blasting through enemy territory. (He’s an expert, at this point.) 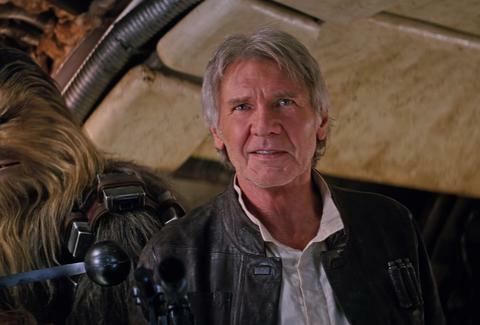 Abrams feeds Ford plenty of cheeky gags with Chewie, but his scenes with Fisher really recapture the feeling of the original trilogy. Though both older and a little stiffer, an emotional connection to the First Order adds weight to their legacy romance. Just beautiful. Oh, and BB-8 the droid is your new favorite pet. If only they had Instagram in the Star Wars universe. What doesn't: There's a scene in the movie where the Resistance's inner circle assesses the First Order's prized possession: a weapon "three times bigger than the Death Star." And in Abrams' hands, Force Awakens is three times bigger than its predecessors, sacrosanct, and on steroids. After Rey blasts off from Jakku (that's inevitable -- it's Star Wars), the journey becomes a mirror-universe version of its source material, staging pivotal moments so as to invoke Star Wars, The Empire Strikes Back, and Return of the Jedi, and peppering the dialogue with references galore (hey, a trash compactor joke!). Abrams' action direction doesn't have the verve to challenge these classic cues. The dogfights never hit a top speed and late-game shootouts suffer from a stiff, suffocating approach. All the problems derive from a general point of confusion: should the set pieces be composed and restrained, as they were in the original trilogy, or should they take full advantage of the special-effects tools that they blew out in the prequels? 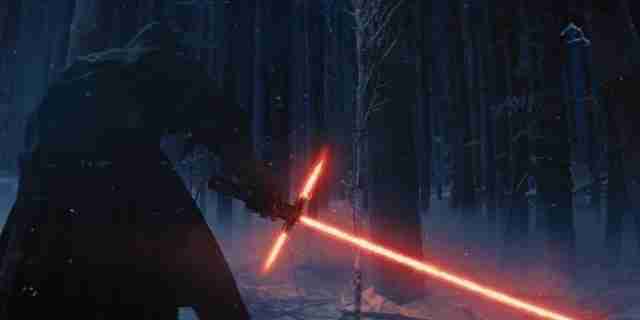 Force Awakens sticks to the middle ground -- and ultimately feels closest to Star Wars Special Edition. The ships seem to be detached from their hyper-detailed backgrounds. Force powers swing at will from subtle to video-game-style carnage. And alien characters rendered with state-of-the-art CG don't stick out next to puppeteered counterparts. The real low is Lupita Nyong’o’s Maz Kanata, an elderly yellow creature who runs the movie’s cantina stand-in, and is a misfire in both execution and performance. Why throw the Oscar-winning Nyong’o under a digital guise when she’s so powerful and radiant? Force Awakens doesn’t make the case. The movie's action matches its light-speed storytelling. The Force Awakens is definitely a J.J. Abrams joint, with loads of backstory and teases for future films to tear through. It's all intriguing, and barely a down beat to enjoy it. Force Awakens assumes Star Wars knowledge asks you to fill in the blanks. The Big Bad is shadowy enough that you’ll be dying to catch Episode VIII. If it were television, that'd feel fine. The MVP: There's not enough to say about Ridley, whose power-converter talk owns as hard as her agility. A close second is Domhnall Gleeson (Ex Machina) who takes on a Grand Moff Tarkin-esque role and delivers a monologue that would make Stalin quiver. A final word: Star Wars: Episode VII - The Force Awakens lacks the vision of Lucas' previous trilogy-starters and the ambition to outdo his films. The saga can only go up from here. See it if... you love anything involving lightsabers, you're looking for pure escapism, and you want to stay relevant. Skip it if... you’re not ready to see a beloved property blockbustered, you think Star Wars is "nerdy," you’ve fallen for a Jedi mind trick -- c’mon, of course you’re seeing Star Wars. Matt Patches is Thrillist’s entertainment Editor. He previously wrote for Grantland, Esquire.com, Vulture, The Hollywood Reporter, and The Guardian. His ship only made the Kessel Run in 13 parsecs. Find him on Twitter: @misterpatches.